Gurgaon: It was a heart warming press-meet where Rakhi and Ayesha shared their experiences post complex heart valve replacement surgeries at the Fortis Memorial Research Institute, (FMRI) Gurgaon. Suffering from life-threatening congenital heart diseases, these surgeries were like a “dream-come-true” for four children and next of their kin. Rakhi, aged 11,was suffering from rheumatic heart disease (RHD) which is a commonly acquired heart disease in children due to acute rheumatic fever. This affects the heart, joints and central nervous system. She underwent Mitral Valve Replacement on April 20th. Her father is a farmer from Aligarh with an annual income of barely Rs 72,000. The family willing came forth to pay Rs. 10,000 as contribution towards surgical cost. Ayesha, 20, also suffered from rheumatic heart disease (RHD) along with other underlying conditions. As her family’s monthly income was barely Rs 5000,the hospital did not charge even a nominal fee. She successfully underwent Mitral valve Replacement surgery on April 23rd. Ashima* (14) and Zayeed* (17) (*names changed to protect identity), was suffering from RHD and an abnormal function of the tricuspid aortic valve disease respectively. The tricuspid valve is located between the right atrium (top chamber) and right ventricle (bottom chamber) of the heart and it has a key role in ensuring blood flow in a forward direction from the right atrium to the ventricle. Both the families decided not to contribute any amount towards surgical costs and the surgery was fully supported by Fortis Foundation. Ashima underwent Mitral Valve replacement;Zayeed underwent Arotic Valve Replacement on April 22nd. 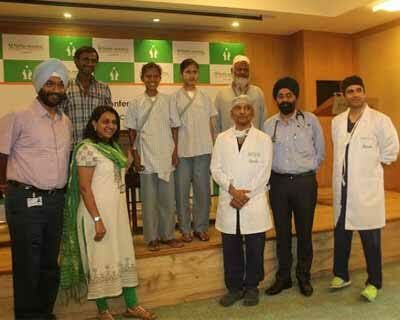 Fortis Foundation in association with Being Human Foundation has been carrying out several such surgeries across Fortis network in India, the above being the latest in the NCR region where four children underwent heart valve replacement surgeries between April 20th– 25th 2016 at the facility. The surgeries were performed by Dr Sandeep Attawar and his team. All the valve replacements were donated by Dr. Vibhu R Kshettry, founder of International Cardiac Outreach and Education at the Minneapolis Heart Institute Foundation, known for his numerous philanthropic efforts. “In India, coronary heart disease is increasingly becoming common among younger age groups. Modern day science and technology (including the reach of internet) and advancement in diagnostics have brought in a paradigm shift in identifying and treating disease in a large segment of the population which was earlier un-diagnosed. Consequently, given the skewed funding process for treatment of children with congenital heart defects such as these and unaffordability in young families in treating their young, there is an urgent need for more organization to support philanthropic work as these to reduce the overwhelming burden of treatable heart diseases. Our goal at Fortis is to contribute to the clinical excellence model in the field of cardiac sciences and the endeavor is to employ economies of scale combined with philanthropy with donor agencies to address the issue,” explained Dr. Sandeep Attawar, Director, Cardio Thoracic and Vascular Surgery, FMRI.